In this June 30, 2015, file photo, flags fly over ConAgra Foods world headquarters in Omaha, Neb. Conagra Brands Inc said on Wednesday it would buy Pinnacle Foods Inc for about $8.1 billion, trying to grab a bigger share of the fast-growing snack and frozen food markets amid fierce competition in the packaged food industry. “There are benefits to M&A on the cost side of things from buying power to supply chains, by being larger. But there’s also benefits on the negotiating side with prices, merchandising and working with retailers,” Weissman said. “We can do a better job of filling full truckloads when we ship to our customers and work more efficiently,” Connolly said, adding that the company will use the cash from cost savings to invest more in developing its brands. 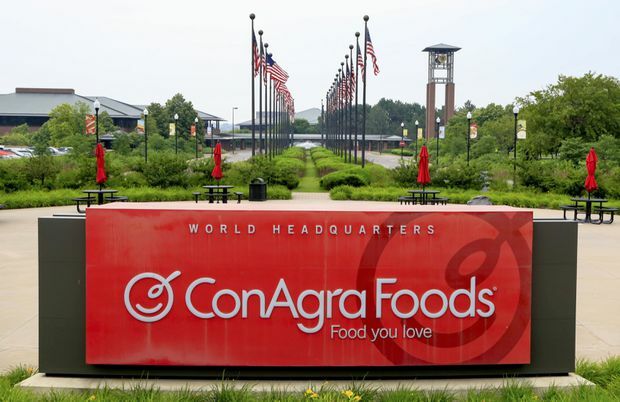 Chicago-based Conagra said the two packaged food companies would have reported a combined $11 billion in full-year pro forma net sales, with $4.9 billion in frozen food sales. It expects to save about $215 million by the end of the fiscal year 2022. The acquisition is a victory of sorts for Connolly, who had unsuccessfully tried to buy Pinnacle when he was CEO of Hillshire. The sale to Hillshire was cancelled after Hillshire agreed to sell itself to Tyson Foods Inc for $7.7 billion. Talks between Conagra and Pinnacle, however, restarted after activist hedge fund Jana Partners LLC in April bought a 9.1 per cent stake in New Jersey-based Pinnacle and urged the company to look for a sale. Conagra stock slid 7 per cent to $35.56 and Pinnacle fell 4.2 per cent to $65. He said the offer was “a bit surprising,” citing other recent deals, such as General Mills Inc’s purchase of Blue Buffalo, which have reached up to 19 times earnings before interest, taxes, depreciation and amortization. Goldman Sachs and Centerview Partners are Conagra’s financial advisers, while Evercore and Credit Suisse are advising Pinnacle.